Mrs. Ashetu Igbawase, the 42-year-old widow who was impregnated by her son-in-law, Mr. Jonathan Ulaha, during her three-month’s sojourn in the latter’s village, Awe, in Nasarawa state, to harvest yam and guinea corn produce, said to be in danger of being destroyed by Fulani herders, has finally aborted the pregnancy, Saturday Sun can authoritatively reveal. This is just as she said she would, in the first part of the story published on Saturday, January 6, 2018 – to avoid turning the mistake into a monument of shame. “She said she wants it aborted because it would be a shameful thing for her to be pregnant at her age when her husband is not alive,” her daughter, Victoria, had confirmed. John, her husband, who is at the centre of the storm had also added then that the pregnancy won’t stand. “I will do my best to plead with my wife to accept aborting it,” he promised Saturday Sun. Well, the deed has been done. The pregnancy has been aborted in accordance with the wishes of the various parties affected, although no one can predict how soon the shame brought about by the inglorious act will dissipate or recede into memories. For instance, although Mrs. Igbawase had since relocated to Daudu, a major town in Guma Local Government Area of Benue state, she confessed that she had continued to regret and to bemoan the abominable incident that brought her so much shame. 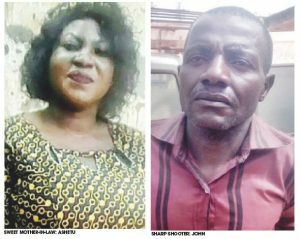 The woman who revealed that her daughter procured the abortion for her, at the cost of N20, 000, at a pharmaceutical shop located in Lafia, Nasarawa state, said she couldn’t have kept the pregnancy for any reason. As to how she got her daughter, who was really embarrassed and embittered about the situation when Saturday Sun met her about three weeks ago, to help out, she said: “I knelt down and begged her to please forgive me for whatever wrong I must have committed. I was crying and you know what that means. Eventually, she saw reasons with me and we aborted it. But my worry then was that she was angry and went public with the whole matter. Weighing in on the development, right activist, Chief Mike Ozekhome, SAN, has said, forcible procurement of abortion, if the person is caught, is a criminal offence. According to him, “The issue is both ethical and legal. Ethical in the sense that it amounts to an odious traditional and cultural taboo for a woman to have a child for the son-in-law, because it could mean that child will be her child, will be the brother to her daughter, while the son-in-law will be the father to her child, and also husband to her daughter. Ethically therefore, it is wrong, and to have such a child is an odious happening even though things have gone haywire in the world. The question also is whether the woman is also not entitled to know whether to keep the child or not. If the child is fully developed, it will become infanticide to kill such a child. Either way, it is a very poor case that the woman should never have allowed to happen at all no matter her hot pants. But if the mother will loose her life for an unborn embryo, it will be better for the embryo to go so that the mother can live as she can have embryos in future. In her reaction, Patricia Chiegboka, Clinical Psychologist, she said what Igbawase did was an abomination. In her words, “First, what she did was an abomination. How can a mother seek sexual solace in her son-in-law? In such a case, the psychological effects on the woman are high. It can result in mental breakdown because she got pregnant from having an illicit relationship with her son-in-law. One of the psychological effects of her recent action is shame. She will experience shame because the act that was done in secret has become public knowledge. They were never prepared for the public to know the secret thing they were doing. As at press time, the Force Police Public Relations Officer, CSP Jimoh Moshood was yet to answer his call or respond to text messages sent to him on the matter. However, the Lagos State Police spokesman, SP Chike Oti warned that such act is criminal and both the woman and those who assisted her are liable.